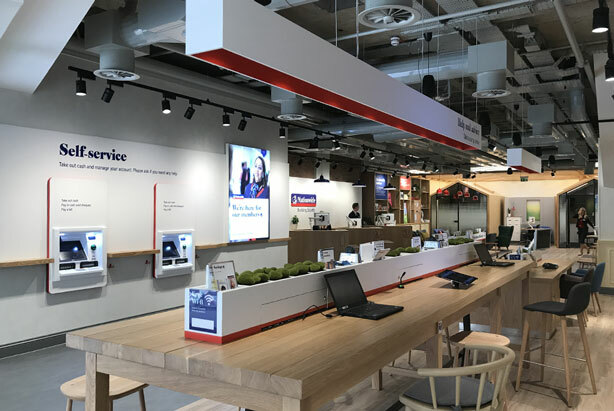 Nationwide building society have launched their new flagship concept in Barnstaple, North Devon. Opening at the end of June in Green Lanes shopping centre the interior is leagues above it’s predecessor, and three times the size. The space offers an entirely new approach to customer service in the retail banking sector and has been designed with the customer’s needs in mind. Today’s customer is looking for a seamless experience with integrated sales and service across all channels. Convenience is key. In our increasingly busy lives there is an expectation that banks should be tailoring their offering to the customer – not pushing products. As we have seen across all sectors the boundaries between customer service, retail and hospitality are blurring. Restaurants now incorporate retail and stores are (allbeit slowly) prioritising their in store experience. So why not within the retail banking sector? We can all remember banks of old – long queues to speak to someone through a glass barrier in a crowded and uncomfortably designed interior. Perhaps you wanted to speak to a financial adviser? Then you would be treated to a stuffy room with bland decor while an banking ‘expert’ would attempt a sales pitch. It is likely you would then hear about a range of products while waiting for the dated computer system to fire up. Recognising that customers no longer want a aggressive sales approach the new Nationwide flagship creates a relaxed and functional space. The design works off the Nationwide four C’s concept. Convenience, Conversation, Consultation and Community. The interior reflects this with clearly defined zones for each area of the offering. As well as the expected cash and deposit machines at the forefront of the store there is also a long bar of iPads with charging stations and online information. Slimline digital screens enable changing messaging for maximum product information. Comfortable seating in a lounge type set up inspires a relaxed mood for conversations. Staff offer fresh coffee and are on hand to answer any questions within an a spacious and open space – that small stuffy room of yesteryear is a thing of the past. Consultation pods are a welcoming home shape with screens and Skype capabilities. This is so that customers can speak to their local branch should they wish to, or get specialist advice at any time if other in-branch staff are busy. You can use the nationwide Now service - which allows you to apply for mortgages and other services through a video link.The privacy of the pods as well as the ability to learn about other products online allows the customer to tailor their experience and interact as much or as little as they need. The verdict? Locals are thrilled with the changes and Nationwide have seen an increase in those coming into the building society. The lounge space is being used and staff report that the reaction has been a very positive one. There is another branch of this concept in Glastonbury, Somerset which has also been well received. It will be interesting to see what some of the other challenger banks and their larger competitors will do next. Lloyds recently announced the closure of over a hundred branches between July and October due to changing customer behaviour. Barclays are also closing 54 branches by the end of 2017, while RBS are closing 161 and HSBC 118. Online and mobile banking is playing a large role and a Which? survey reports that there has been a 32% drop in branch use since 2015. So what if you don't like online banking and your local branches are closed? Lloyds are planning to tackle this by rolling out a fleet of mobile banks with a potential 16 on the road by the end of the year. How long before the other players catch up? And what of the physical store? Watch this space.